Parenting is stressful, but when your child has medical complexities, you face unique stressors that some other parents are not familiar with. In addition to the typical struggles that parents face, you also have added concern for the health and wellbeing of your child due to their condition. For some, this can mean a high amount of stress. 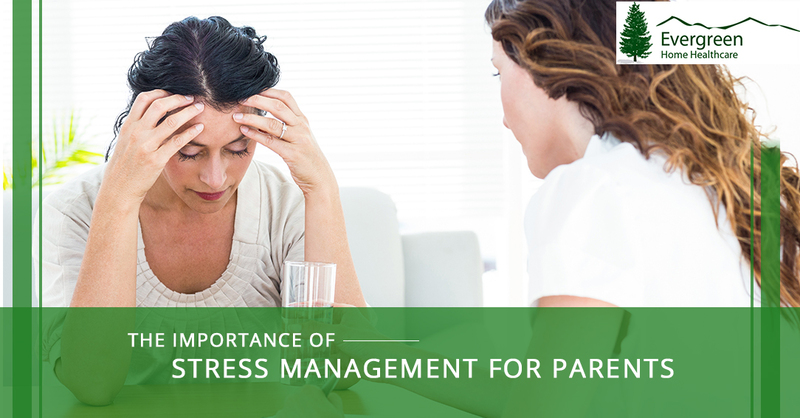 Because April is National Stress Awareness Month, we want to shed light on the impact of this stress on parents, and give some tips to help you cope in a healthy way so you can enjoy the joys of parenthood. Many people are aware that they are stressed, but may not realize the impact it has on their mental and physical health. Just because you don’t acknowledge your personal stress, it doesn’t mean that it isn’t there. You may ignore the stress that you are under, but your body and mind can’t. When you experience chronic stress, these symptoms can escalate into diseases, whether because it changes your body or because of the coping mechanisms you turn to. To be the best caretaker possible it is in the best interest of the entire family for you to prioritize stress management. When you are focused on the negative, that is all you see anywhere you go. This, in turn, ruins your mood and makes your stress all the more consuming. Instead of focusing on the bad stuff, limit the amount of exposure you get to negative stimuli. Don’t let the things you don’t have to focus on drag you down. Steer clear of disturbing media, don’t spend time with rude people, and avoid situations that are going to add to your stress. On the flip side, make more room for what’s good in your life. Instead of feeding into the endless news cycle, for example, unplug and read a book from your favorite series. Pay attention to your child’s successes, and the joy they bring to your life. Hug your family and share happy memories with them. Read inspirational stories about children with your kid’s condition. Keep focused on the positive things that your child’s condition brings to your life, such as a community of people around you. Surround yourself with positive and you will see a reduction in the impact of stress on you. Time is a limited resource for parents, which often results in scheduling less of it for certain tasks. This can cause you to feel significantly more stress and you run from doctor’s appointments to after-school activities to the pharmacy to play dates. It’s typical for people to underestimate how much time they need to get things done, and the pressure to stick to your schedule can overwhelm you. Consider adding more of a cushion into your routine to get things done, even if it is only an extra 15 minutes. The ability to be more leisurely about getting everything done significantly reduces stress. As a parent of a medically fragile child, you probably feel your child’s pain — literally. This type of empathy is called “affective empathy,” and it can have an extreme impact on your stress levels. Parents who experience this type of empathy have a more difficult time coping with the problems their children face, causing more stress. Try to shift to “cognitive empathy” instead. Instead of trying to feel what your child feels, reflect more objectively on how they are feeling, and what would make them feel better. This type of empathy doesn’t cause the same physiological problems as affective empathy. You don’t have to live your child’s pain in order to help them; in fact, viewing it in a more detached way can make you a better caretaker and parent. As a parent, sleep can be hard to come by, and when you are stressed out about your child’s medical condition, you may lay up nights worrying about them. Sleep is important for your health, but what doesn’t help you sleep is adding onto those worries by stressing out about how little sleep you are getting. Counting the hours you have left to sleep, focusing on how tired you will be tomorrow, and feeling resentful about it doesn’t help you get any more sleep. People are more successful with their sleep troubles when they stop trying so hard. Focus on accepting your sleep troubles for what they are and not trying to change them, and you don’t have to cope with the stress of obsessing over your sleep. This shift in perception has shown effective in helping people recover from insomnia. Parents with medically fragile children often feel selfish if they put themselves first. However, shoving your happiness aside for your family only serves to further stress you out and puts a strain on your relationships. Make sure that you are taking time to pursue meaningful happiness, whatever that means for you. If you are an artist, set aside time to paint. If you find joy in gardening, don’t neglect your plants. Make “you” time for what makes you genuinely happy. We don’t walk this path in life alone, and we should all be grateful for that. If you feel like you are holding the burden of responsibility for your child’s care all on your own, the stress will feel a lot heavier. Find a community that will help you carry that load, whether it is a support group, faith community, or social club. Alternatively, turning to a therapist or a close confidant can make you feel a little less alone, and therefore, less stressed. One of the first areas of self-care that parents tend to neglect is exercise. This is a big mistake because exercise is one of the most effective things you can do to lessen the impact of stress on your body. The key is to make exercise something you genuinely enjoy doing. Don’t try to force yourself to join a CrossFit gym if you hate every single workout. Go with something that makes you happy, whether it’s a dance-based fitness class, hiking, running, biking, or yoga. Prioritize exercise as an essential part of your routine. At Evergreen Home Healthcare, we understand how stressful it can be to have a child with medical complexities, but you don’t have to do it alone. If you are looking for medical support for your medically fragile child in Denver, contact us for pediatric home health care.